I let out strands of line from the grass trimmer head. This gives the whirling mass a new pitch much like the sound of angry bees preparing to swarm. Across the lawn my son blinks the stinging sweat from his eyes as he labours up hill pushing 4 horses of rotating fury. Squinting into the cloudless sky I look for some epiphanic wisdom to explain why I’ve mortgaged the opportunity to create summer memories with the boy for want of a manicured lawn. This is wrong….this is very wrong. I tap him on the shoulder and give the twisted throttle sign that says we’re done here. The fates smiled upon us as the Ontario Dual Sport Club was organizing a 400 km big bike friendly ride practically in our back yard. This was the perfect opportunity to introduce the lad to organized group riding but since he wasn’t sure what to expect we opted to do it 2-up. After a brief riders meeting at the Tim’s in Durham, it was time to Carpe the crap out of Diem! Agatha, (my KLR) seemed to sense our need to shed pedantic thoughts as she nimbly bounced from rock to rut with nary a fuss. I immediately picked up on the parallel. My son is Calvin and I am Hobbs while Aggie plays stunt double for the little red wagon. We gleefully careen down the metaphorical hill contemplating physics, theology, man’s place in the cosmos and a Spiderman vs. Batman cage match. 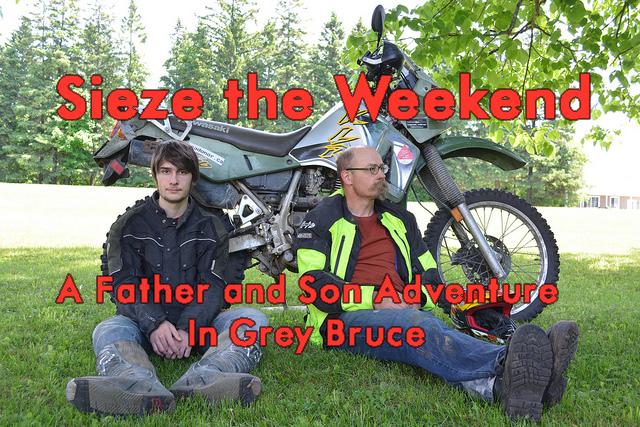 The Grey Bruce peninsula is chock full of incredible riding opportunities. It may not have as many twisties when compared to some regions, however it more than makes up for it with the staggering number of other options. In one day you can visit three motocross racetracks, do a waterfall/lighthouse tour, explore hundreds of kms of single track road allowances or just cruise the Huron and Georgian Bay shorelines. Add a day or two and you can charter a salmon boat, snorkel sunken wrecks, hike the caves or chill on a beach chair in front of Ontario’s best sunset. All of this starts less than 2 hrs from Toronto with none of the 400’s cottage country traffic insanity. Visit www.ridegreybruce.com or the Ontario Dual Sport Club for more intel on the remarkable untapped riding opportunities in the area. Whether you chose street, dirt or both, it’s all here. Aggie’s suspension unloads when we crest a rise with a long, steep descent on the backside. Our stomachs go giddy with the drop as we hold our breath and simultaneously calibrate the ambiguities of the universe. I quietly mumble a breathy vow to maintain vigilance over lost opportunities. The lawn can wait. Life has but a finite number of summer weekends. Oliver is an adventure rider par excellence - having ridden over 8000km on ice roads from Owen Sound to Fort Severn on the banks of Hudson's Bay on a Kawasaki KLR.